The most curiously-monikered debut of recent times is probably Ladies' Gunboat Society, ostensibly a reference to Civil War-era women's clubs dedicated to raising funds for warship construction. Yes, LGS has taken over the old Flores space on Sawtelle, with Brian Dunsmoor replacing opening chefs Rob Lawson and Angela Hernandez, who left at the end of March. Dunsmoor, of course, was one half of the duo at The Hart and The Hunter, and although compatriot Kris Tominaga is unattached to this project, H&H GM Jonathon Strader is heading up front-of-the-house duties here. Sarah "Bearclaw" Lang is serving as Pastry Chef, and the kitchen is rounded out by CdC Dave McMillen and Sous Jeff "Poose" Figueroa. Given the Chef's Georgia roots, it's not too surprising that the menu at LGS tends Southern, though it is important to note that the food here's quite distinct from the offerings at the other restaurant. The menu at Ladies' Gunboat Society is described as "Southern farm-to-table," and that's probably not too far off the mark, with smallish plates that, natch, are good for sharing; they also do a full brunch on the weekends. 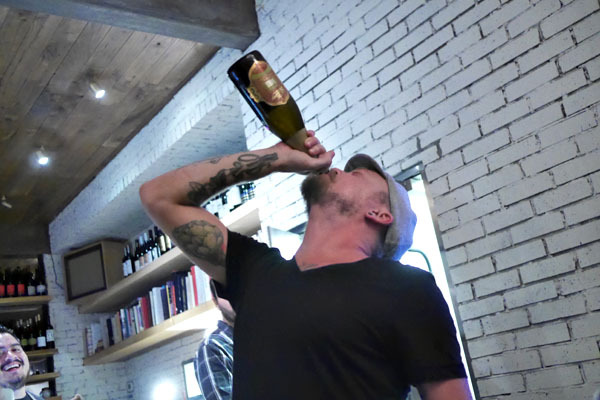 To imbibe, Strader has put together a small California-centric list of wines joined by a handful of sakes and the requisite craft beer (via nine taps). Click for larger versions. 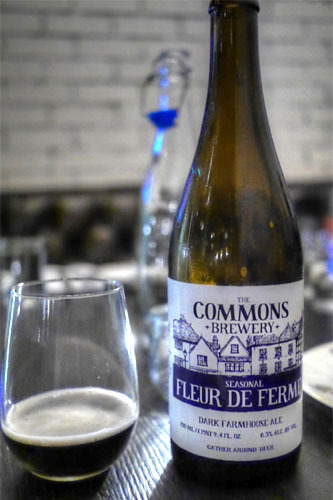 We weren't charged a corkage fee, and so we were able to enjoy some beers from home, the first of which was The Commons Brewery Fleur De Ferme, which I'd picked up during my recent trip to Portland. It was a dark saison brewed with hibiscus, chamomile, and lavender, and conveyed wispy floral nuances over an herbal, slightly astringent base. I would've liked more of a farmhouse funk in the beer though. One of The Hart and The Hunter's claims to fame was their butter biscuits, which were undoubtedly some of the best I've had. 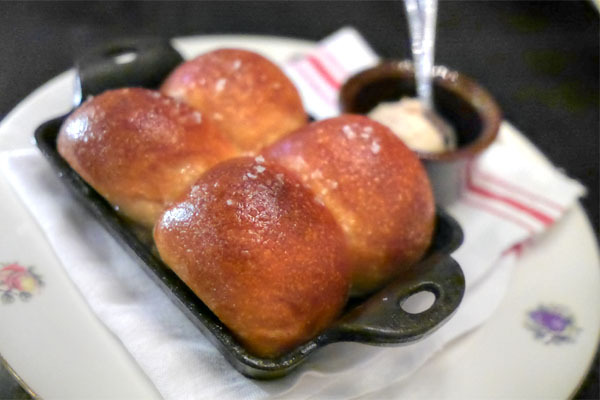 The rolls here, though, might just be better, coming out airy, light, yet substantial, with a perfect blend of salty and sweet flavors that kept me coming back for more. 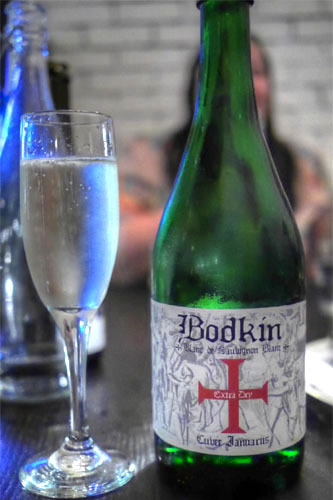 In addition to the beer, we were also in the mood for some bubbles, and ordered up a bottle of the bodkin sparkling sauvignon blanc [$48]. It was a dry, bracing sort of sparkler, very lively and effervescent on the palate, with a backbone of crisp lemon. 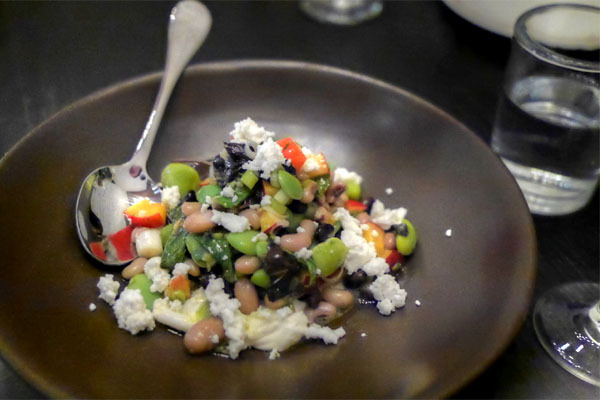 The pea salad, meanwhile, was the surprise standout of the night. I found it a gorgeous mélange of disparate elements that just came together flawlessly, with delectably sweet, savory, and herby nuances underscored and integrated by the creamy lushness of that cheese. 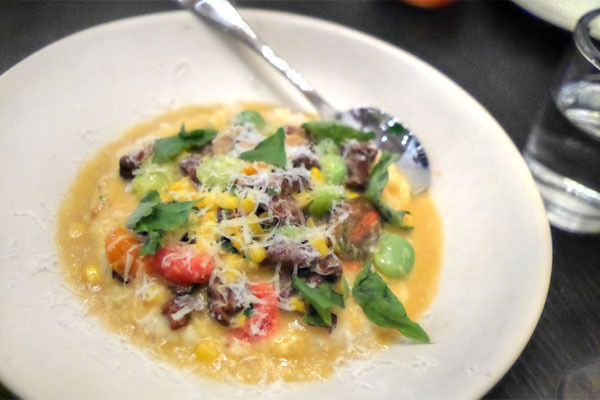 The grits were a must try of course, a hearty, homey presentation that superbly tied together its various ingredients, the classic combination of tomato and basil forming a great counter to the sweetness of the corn, all while mushrooms added further texture and heft to the dish. 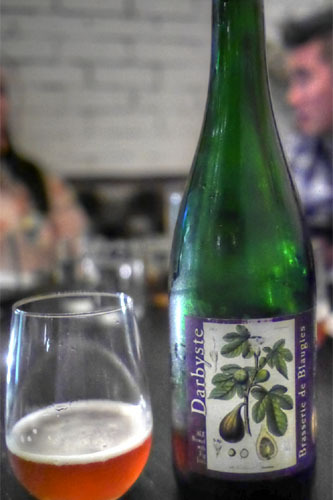 Our next drink was the Brasserie de Blaugies Bière Darbyste, an ale made with fig juice (and named after botanist John Darby). Here you had a backdrop of light funk and tartness, with a Belgian-y character and just a hint of figgy goodness toward the back end. I actually expected the fruit to figure much more prominently here. 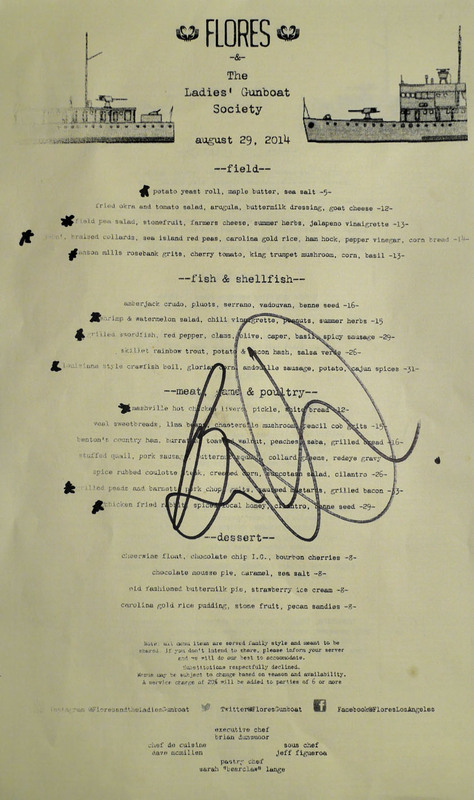 Naturally, we had to give the restaurant's unofficial signature dish a go, and it didn't let us down. The Low Country staple Hoppin' John brings together Sea Island Red Peas and Carolina Gold rice, both sourced from Anson Mills I'm guessing. It's a classic combo that definitely satisfied on its own. 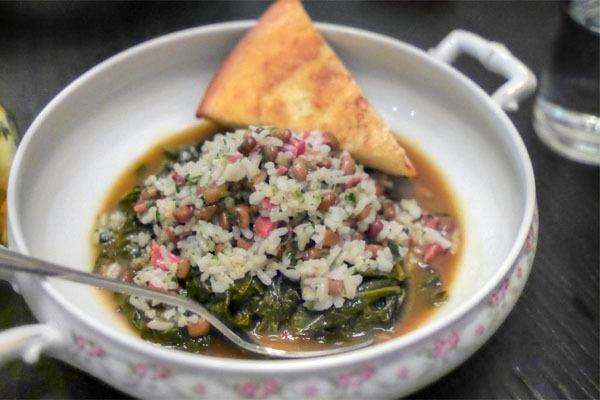 However, the dish was taken up a level by the inclusion of ham hock, which added blasts of salt and smoke to the fray, as well as the collards, which had an earthy bitterness that really underpinned the dish. You should probably order this; just make sure to add a dash of the included pepper vinegar to some of your bites as well (it's damn good). 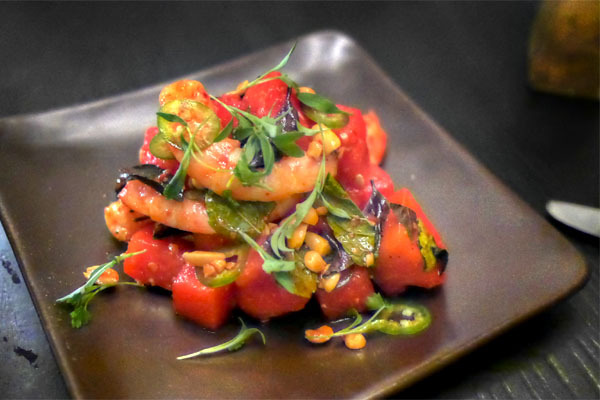 Perfect for the summer was the Chef's shrimp and watermelon salad, a bright, refreshing plate that really highlighted the crustacean. Great mix of sweet, spicy, and herbaceous notes here, and I appreciated the Asian-y tinge to the dish imparted by the inclusion of fish sauce. 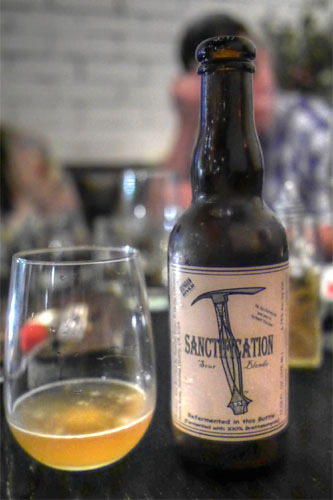 I hadn't had Russian River Sanctification in a long time, so I was really surprised at how good it was. A 100% Brett beer, this one was gloriously tart, with a delicious, distinct vinous quality to it intermingled with notes of citrus and oak. Yum. I'm generally not a huge fan of swordfish, but quite liked the preparation tonight, one of the strongest I've had no doubt. The fish itself arrived firm, briny, and really juicy, a pleasant surprise given that it's often served on the drier side. 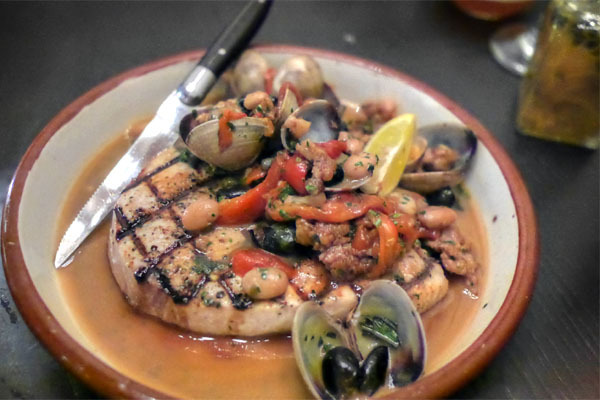 Its inherent salinity was taken up a notch by the inclusion of clams, and I appreciated the counterbalancing zing of the olives and capers here as well. My favorite thing just might've been that sausage though, which gave up a great bit of savory, spicy heft to the dish. 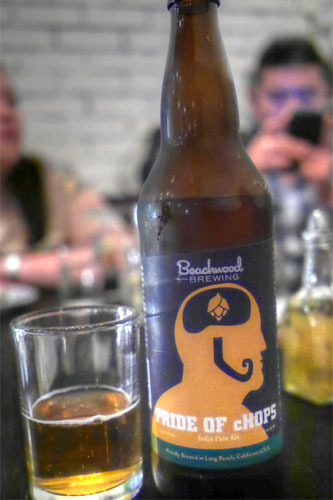 Our requisite IPA was the 2014 Beachwood Pride of cHops, a one-time bottling (brewed to commemorate the 20th anniversary of O'Brien’s Pub in San Diego) that was released just earlier in the week. The nose was fantastic on this one, wonderfully aromatic, fruity, pine-y, and just beckoning you for a sip. Its taste was just as fresh, with more tropical fruit, spice, and a great bit of countering maltiness to even out the hops. Another fine effort from the folks over at Beachwood. 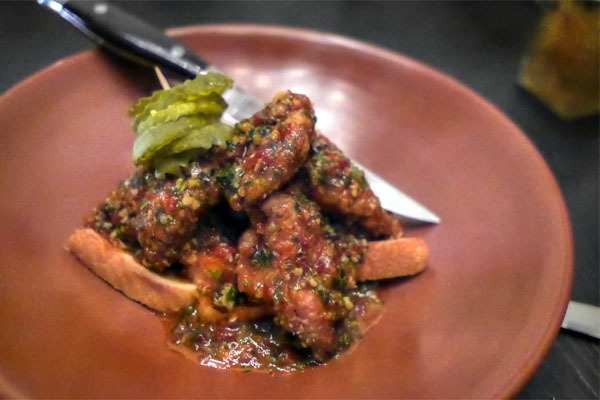 Chicken livers were playfully presented here, their deep, earthy, offal-y flavors effectively evened out by the sharp, sweet, heat present while the Vlasic pickles provided just the right amount of crunch and tartness to things. Pork from San Diego area producer Peads & Barnetts managed to be one of the tastiest chops I'd had in a while, a tender, succulent, immensely flavorful preparation further enhanced by the intensity of the paired bacon. Great bitterness here from the mustard greens as well, and you can't go wrong with more grits either. 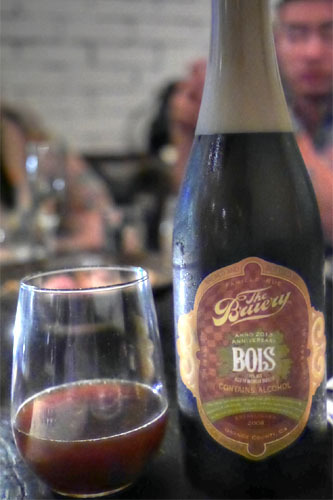 Last up was the 2013 The Bruery Bois, the brewery's fifth anniversary beer made in the English old ale style, blended using the solera method, and aged in bourbon barrels. It was a robust, heady beer to be sure, with an aroma redolent of alcohol-soaked raisins. That "port-y" quality continued to the palate, where you had more dark fruit, caramel, brown sugar, bourbon, and vanilla, all underscored by a not unpleasant boozy backbone. A doozy for sure. 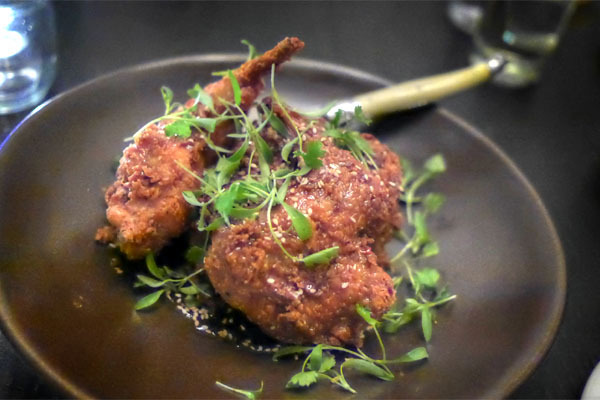 Our last savory was rabbit done in the style of fried chicken, one of LGS' early hits. They were tasty morsels, quite flavorful and with a delightfully crisp crust. A brush of honey imparted intriguing spicy-sweet notes to the rabbit, though I'd prefer the sugariness turned down a notch. Dunsmoor made quick work of the remaining Bois. Time for some desserts from "Bearclaw." 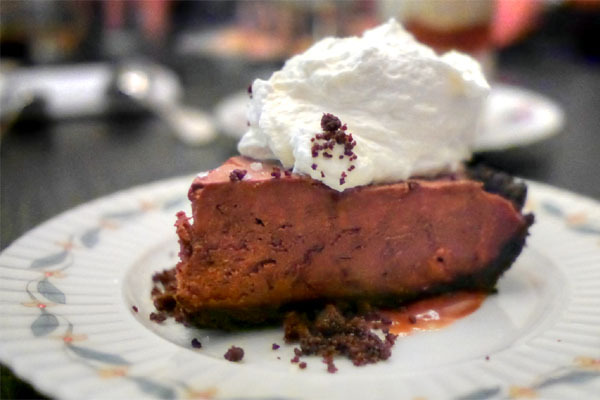 The chocolate mousse pie was a spot on rendition of the dish, with the chocolate pairing swimmingly with pricks of sea salt while the topping of whipped cream imparted a touch of levity. Excellent crust here, too. 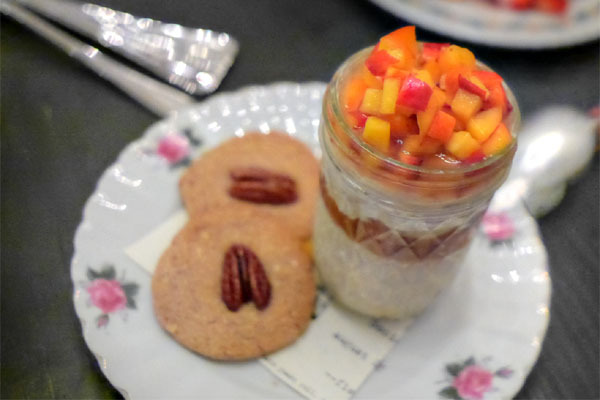 The rice pudding was on point as well, really showing off the sweet, satisfying nature of the rice while stonefruit added a juicy, summer-y note to the dessert. 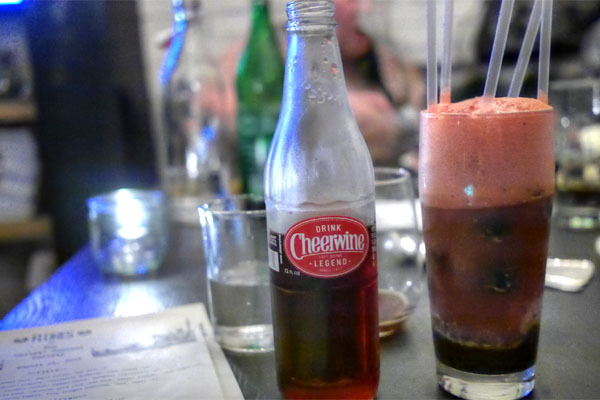 I was pretty enamored with the Cheerwine float, that combination of cherry and chocolate flavors really speaking to me, especially when enhanced by the boozy tint of bourbon. 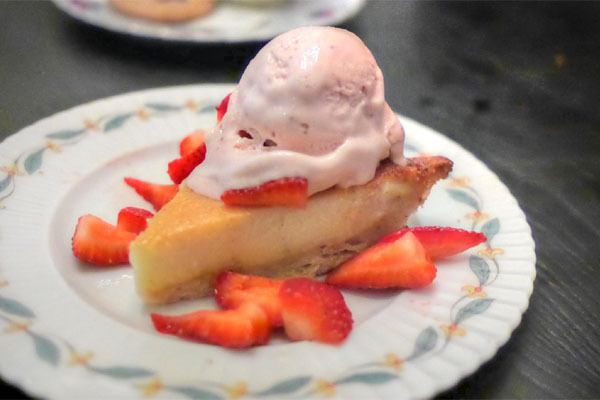 We closed with the buttermilk pie, a lovely interpretation of the dessert that I was rather fond of. 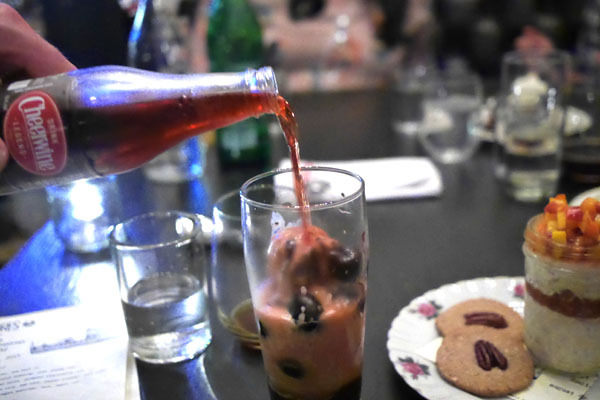 It was great texturally, and had a restrained sort of sweetness that worked well with the two forms of strawberry present. 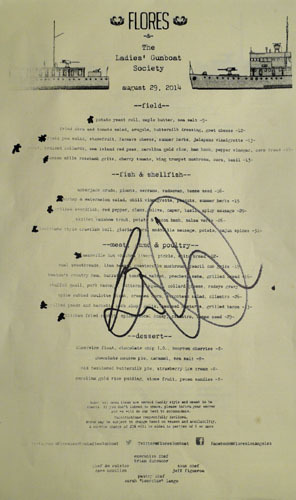 I was very satisfied with my meal here, and was impressed by the direction that Dunsmoor's cooking is taking. Perhaps it's the singular focus he has now with Tominaga out of the picture, or maybe the nicer kitchen setup, but I think he's improved on what he was putting out at H&H (or its progenitor, Wolf in Sheep's Clothing, for that matter). 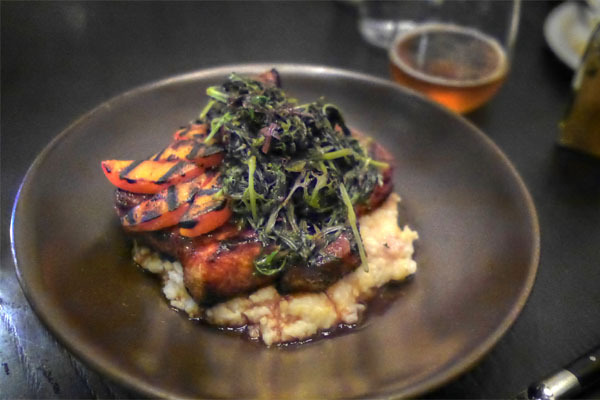 The food's got a great base of Southern tradition to it, but the chef's twists and Cali-ish improvisations really worked for me. As for what's next, Dunsmoor and Strader are partnering up again for another restaurant concept, and let's not forget that Kris Tominaga's teaming with Freddy Smalls' Jeff Weinstein for a new place in Santa Monica called Cadet. 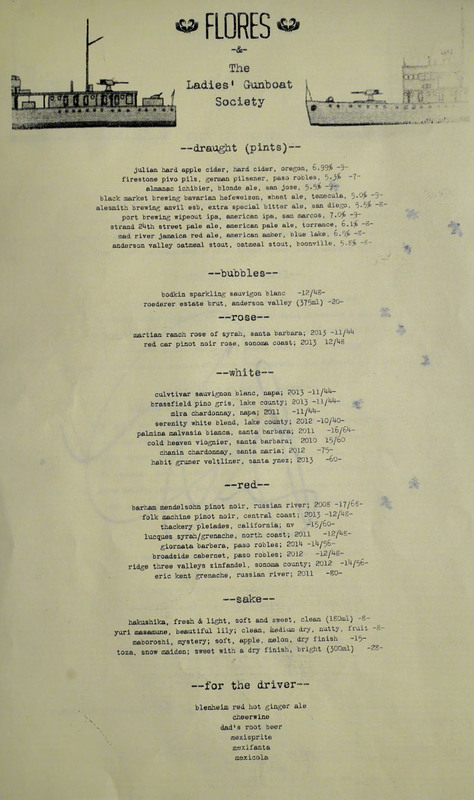 This menu reads like Sean Brock's greatest hits or season 2 of The Mind of a Chef. Anonymous #1... with the requisite Anson Mills grains, natch. Are you attending Zwanze Day this year, Kevin? Anon: Is that necessarily a bad thing though? Anon: I usually shoot for a party of four--not too big, not too small. Plus, you can also give away the booze to the staff; they always appreciate it. Anon: Any other producers he should be using instead? Anon: Nah, I forgot to buy tickets.